In my third week of eating along the lines of the VB6 (vegan before 6) meal plan I hit a happy stride with an Ottelenghi-esque salad. A friend had long been trying to get me to try it and I finally had most of the ingredients to give it a go. Here is his original recipe which I read only after attempting to recreate what I had remembered from reading the recipe before. I started by simmering some red onions, carrots and jalapeño in cider vinegar (he used white, no sugar and only marinated), sugar and salt which I then cooled. I could tell by the smell that the jalapeños were super hot so I picked them out and stored them separately. I then soaked some chopped dates in the onion liquid while I toasted some ripped up bits of whole wheat pita with sliced almonds and urfa pepper (he stirs in sumac which would be great and red pepper). Our garden is kind of weenie this year but I was able to pick a pile of arugula to mix with lettuces (he uses spinach) which I then tossed with the dates, onions, a bit of the vinegar, the pitas and nuts. 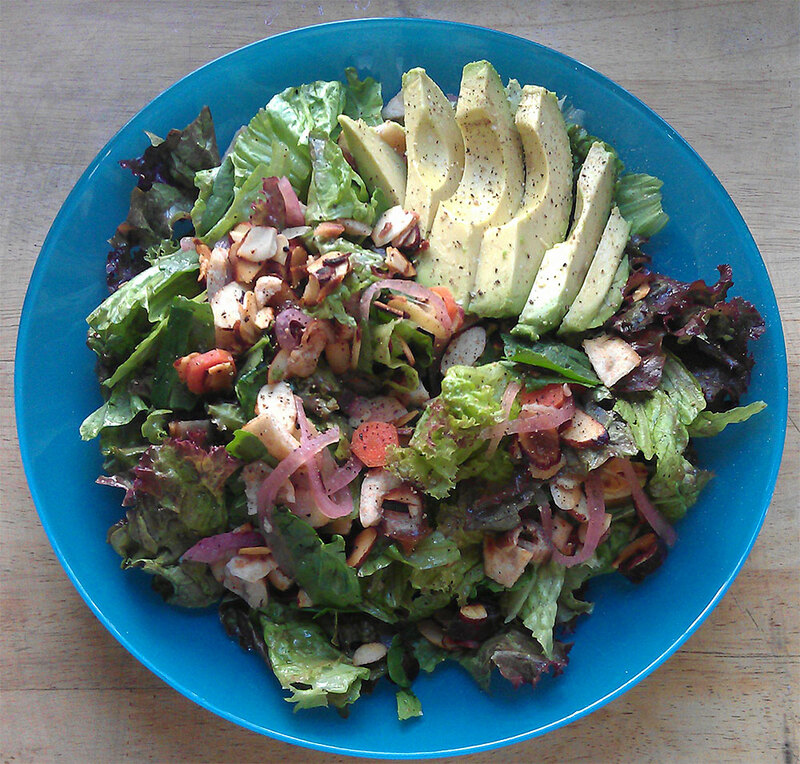 I decided avocado would be a wonderful balance to the sweet and tangy (he drizzles on more olive oil and lemon). Despite the differences, I thought this salad was amazing and ate it three days in a row. It was satisfying and surprisingly filling and got me thinking about all sorts of different salady items featuring bursts of pickled veggies and fruit. There are several ideas and preparations percolating, but today’s lunch (and dinner side dish) produced another satiating meal. I toasted and cooked some israeli couscous and then quickly browned and simmered some sweet potato cubes in some vinegar. I wanted to leave them just slightly crunchy and have them pack a flavor punch so I added some lime and aleppo pepper. 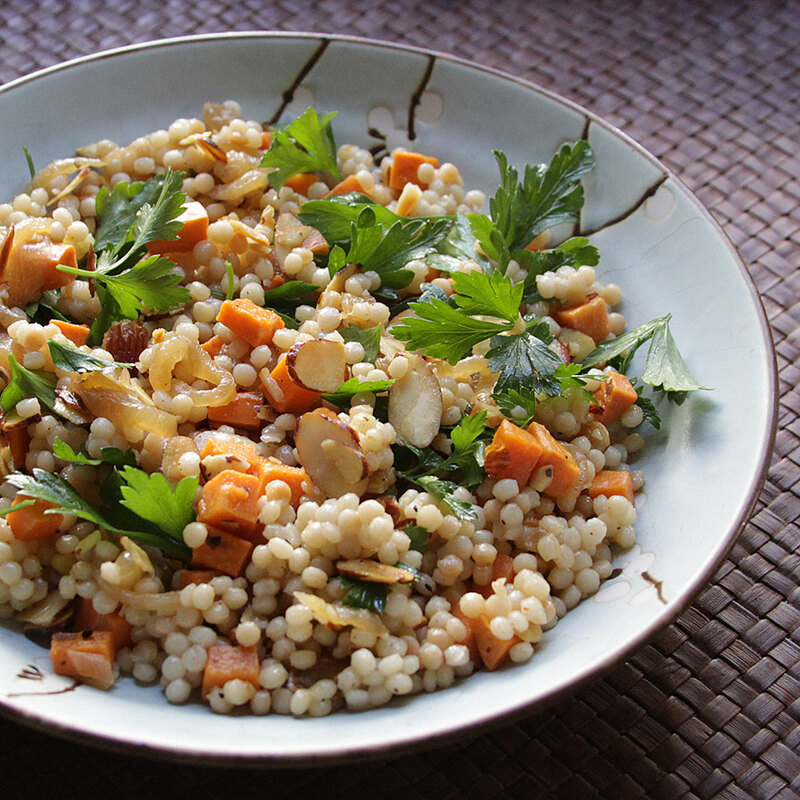 I tossed them into the couscous with some caramelized onions I had in the freezer, toasted almonds and a big handful of parsley for a fresh, bright bite. It was delicious and would be great along side of a grilled steak for dinner … which I am already daydreaming about. This entry was posted in Salad, VB6, Vegetarian by Marina Chotzinoff. Bookmark the permalink.